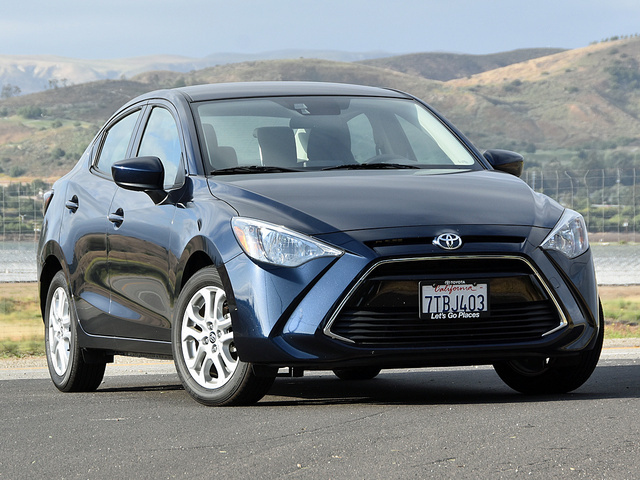 CarGurus has 1,271 nationwide Yaris iA listings starting at $8,099. The 2017 Toyota Yaris iA is a tiny and inexpensive little sedan that will surprise you by how refined, responsive, and remarkably good it is. Cutting to the chase, I like the Toyota Yaris iA. However, it is important to make a critical distinction between the Yaris iA and a standard Toyota Yaris hatchback. The iA sedan was originally a Scion. When Toyota cancelled that youth-oriented brand after the 2016 model year, it folded the iA sedan into the existing Yaris lineup of 3-door and 5-door hatchbacks, which have nothing in common with the iA sedan aside from a nameplate. 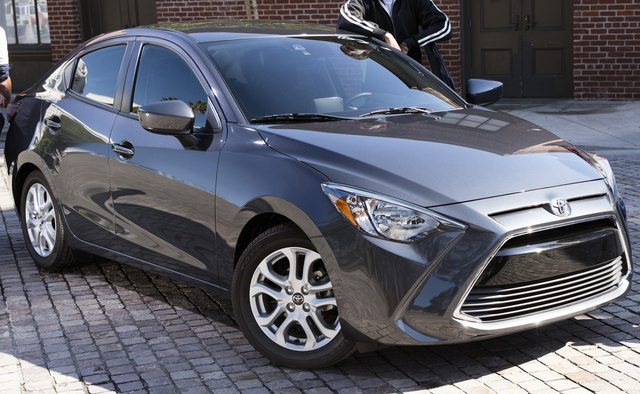 While the Yaris hatchbacks offer tempting levels of utility, the Yaris iA sedan is the one you want if you’re shopping for a small and affordable Toyota. That’s because aside from Toyota emblems and a questionably styled face, the iA sedan represents 100% Mazda goodness. 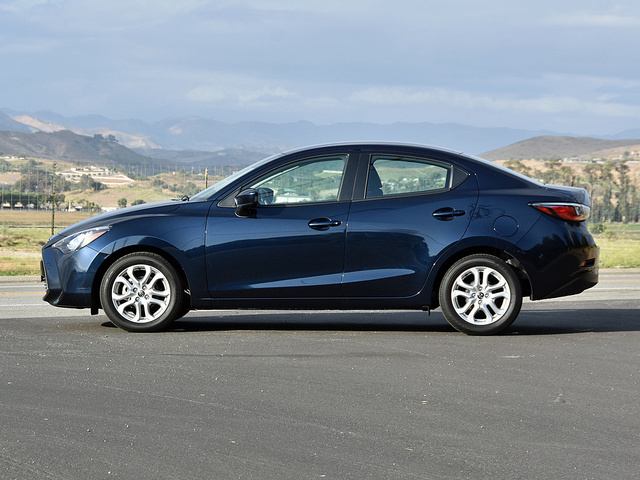 For a couple of good reasons, Mazda no longer sells the Mazda2 in the U.S. First, when gas got cheap and the economy got healthy, people stopping buying subcompact cars. Second, in the U.S. market, Mazda is trying to move itself into premium-brand territory, and the Mazda2 doesn’t fit into that strategy. This situation made it painless for Mazda to allow Toyota to badge-engineer the car as a simple and easy update to the stagnant—and now dead—Scion lineup. 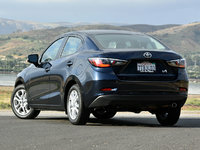 To turn the Mazda2 into a Scion, Toyota restyled the front end and replaced the Mazda emblems with Scion emblems. 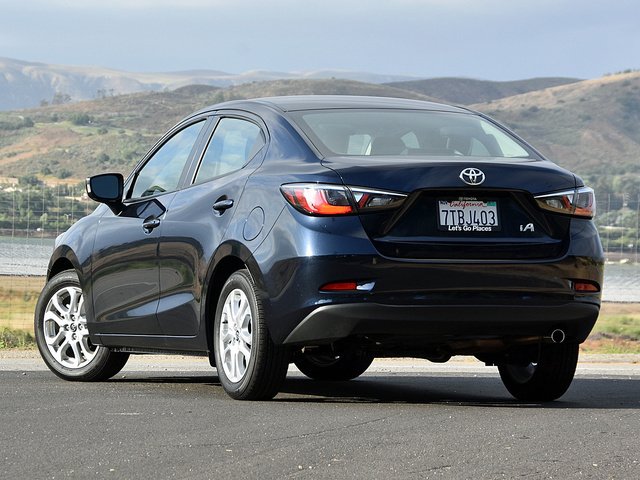 Then, to turn the Scion iA into the Yaris iA, Toyota replaced the Scion emblems with Toyota emblems. Because Toyota makes almost no effort to hide the iA’s lineage, it isn’t hard to see Mazda’s design DNA. Look past the funky front end, which appears to be wearing some kind of a vacuum attachment, and Mazda’s styling language is blatantly obvious in the car’s profile with its converging character lines, in the appearance of the standard 16-inch aluminum wheels, and in the elegantly tapering taillights. 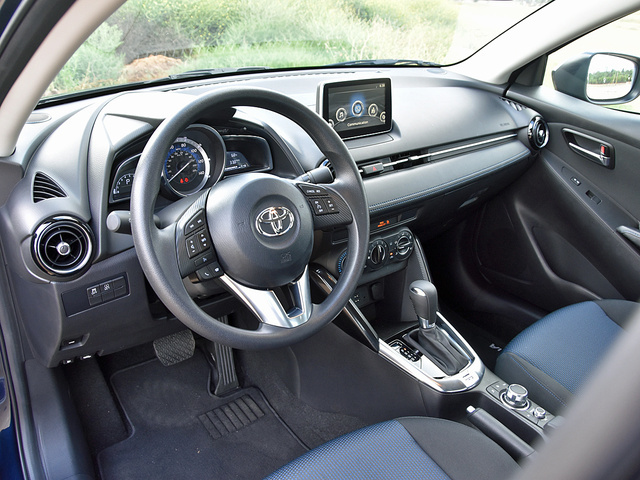 Inside, the only evidence of Toyota’s meddling is the badge affixed to the steering wheel. From the quality of the materials and attention to design detail to the center console controls for the freestanding infotainment display screen, the Yaris iA’s cabin is pure Mazda, which is a very good thing for bargain-hunting car buyers. The refined plastics, the fabric door-panel inserts, the blue exposed stitching and soft-touch dashboard trim, the purposeful gauges and switchgear, the way the shifter feels when you choose a gear, the way the doors sound when you shut them… this is the stuff of more expensive automobiles and not a car that costs less than $18,000 before applying any discounts. In fact, in my opinion, the Yaris iA’s cabin is nicer than a Corolla’s. Or even an entry-level Camry’s. It is not, however, more accommodating of passengers than those larger vehicles, so if you’re planning to regularly carry more than one extra person, you’re probably going to want a different car. If the Toyota Yaris iA is right for you, the decision-making process is simple. Determine whether you want a manual transmission ($16,835 including the $885 destination charge) or an automatic transmission ($17,935). Pick a paint color, select any dealer-installed accessories you might want, and you’re done. My Abyss Blue test car had the automatic and nothing else, putting the sticker price at less than $18,000 before factoring in discounts. The Yaris iA's standard 6-speed manual gearbox and optional 6-speed automatic transmission are bolted to a smooth-revving, Mazda-sourced, 1.5-liter 4-cylinder engine that makes 106 horsepower and 103 lb-ft of torque. Row the gears yourself and you can expect to get 34 mpg in combined driving. Choose the automatic, and the car should return 35 mpg. My test car had the automatic, and it returned 33.6 mpg on my test loop, but I drove it harder than you would. Also, by the end of a week serving my household, the Yaris iA’s average had crept up to 34.7 mpg. Because the car is so light, weighing either side of 2,400 pounds depending on the transmission, there is an adequate amount of power unless you’re on a short freeway on-ramp leading to fast-flowing traffic or you’re trying to pass slower vehicles. Sincerely, I do not recommend trying to pass on a two-lane road unless you have a death wish of some kind. Around town, the Yaris iA feels lively enough provided you’re not trying to win an impromptu drag race. A Sport driving mode provides extra responsiveness by eliminating the transmission’s tendency to upshift into second gear sooner than you might like, but it also holds engine revs higher when you’re just driving along at a steady rate of speed. Alternatively, the automatic transmission provides a manual shift gate that allows the driver to take full control of shifting. Just remember that you push the gear selector forward, or up, to downshift and back, or down, to upshift. This pattern is derived from F1 racing, where drivers fighting against significant g-forces require it. Since a Yaris iA generates virtually no g-forces, this design simply comes across as counterintuitive. On the highway, the key is to preserve your momentum. The car’s tidy size and excellent outward visibility help in this regard, and an attentive driver can pick a line through traffic in order to maintain speed. Plus, when the car encounters a hill, the transmission automatically holds a lower gear to keep the Yaris iA from becoming a rolling traffic cone. I tackled the Conejo Grade in California’s Ventura County at a steady 75 mph, the car’s refined power plant issuing not a hint that it was working overtime. Where Mazda’s engineering brilliance shines brightest is with regard to the car’s ride and handling. The underpinnings are simple: MacPherson struts up front, a torsion beam rear axle, front disc and rear drum brakes, and electric-assisted steering. But Mazda tunes these basic components to deliver engaging driving dynamics. The ride is almost supple. The handling is light and lively. The car is tossable in turns and solidly secure at speed. Yes, you can tell from the brake pedal’s feel that the Yaris iA is using drums in the back, but modulation is better than expected. And yes, the electric steering’s sport tuning appears to add more heft than it does actual road feel, but it proves reasonably sharp and responsive even if it feels a bit disconnected on center. If there’s anything to complain about with regard to the Yaris iA’s handling, it’s that the 185/60R16 tires run out of talent pretty early in the game, making for squirrely at-the-low-limit driving. Still, this is an unexpectedly enjoyable car to drive, offering proof that it is often more fun to drive a slow car fast than it is to drive a fast car slow. Anyone familiar with Toyota products will get into the Yaris iA and immediately adopt a look of confusion. Anyone familiar with Mazda products will feel instantly at home. 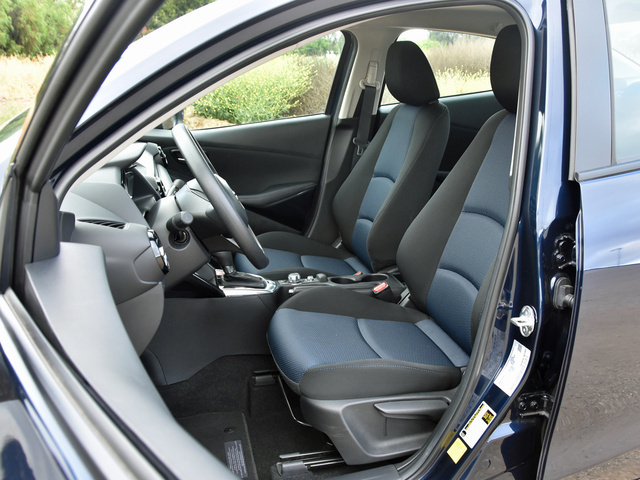 I’ve already covered the remarkably good quality of the Yaris iA’s interior materials and attention to design detail. As far as the control layout is concerned, the iA exhibits intuitive placement and logical markings with the single exception of its plain and basic infotainment system. The driver’s seat is surprisingly comfortable, thanks in part to a tilt/telescopic steering wheel, a manual seat height adjuster, and a generous amount of seat-track travel. The only issue is that this is a narrow car, so depending on your body type, you might feel squeezed. 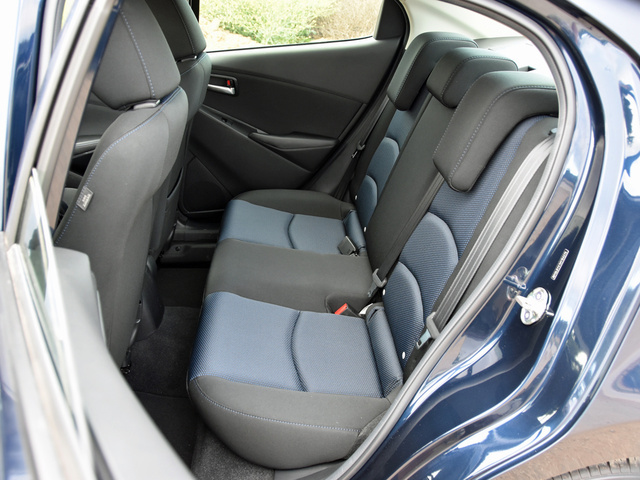 Front passenger comfort levels are similar, but there is no seat height adjustment for that side of the car. A center armrest isn’t standard, either, but you can add one as a dealer-installed accessory for just $195. Rear seat comfort is another story. My kids fit fine, but if tall adults are riding up front, another set of tall adults won’t be happy in back unless the trip is a very short one. The rear headrests nest with the rear seatback to improve visibility and must be raised when carrying passengers. After they’ve departed the car, you’ll need to manually collapse them again. Pop the trunk and you’ll see that the Yaris iA offers 13.5 cubic feet of trunk space. That’s almost as much as a midsize car. A 60/40-split folding rear seat increases utility, and if you’re willing to wrestle with your luggage, you can carry full-size suitcases on their sides. Essentially, the Yaris iA is equipped with a stripped-down version of Mazda Connect technology, modified for use in a Toyota product. It includes a reversing camera, Bluetooth connectivity, dual USB ports, and an auxiliary audio input jack. The 7-inch touchscreen display provides impressive graphics, and while it takes time to get the hang of its center console screen controls, they eventually do become somewhat intuitive. They aren’t better than knobs and buttons on a dashboard, though, and they're inferior to Toyota’s family of Entune infotainment systems. Plus, they falsely advertise a navigation system, which is unavailable for this car. You can’t get satellite radio service, either, and Toyota doesn’t offer Apple CarPlay or Android Auto due to privacy concerns. Remote keyless entry with push-button start is standard, though, something that cannot be said for an entry-level Camry that costs thousands of dollars more. In addition to a reversing camera, a low-speed automatic emergency braking system is standard for the Yaris iA. These features add a layer of preventative safety to the car, which supplies impressive crash protection in the form of a 5-star rating from the federal government and a Top Safety Pick rating from the Insurance Institute for Highway Safety. Considering what this car weighs, those impressive ratings are especially important. What would be nice is for Toyota to offer its Safety Connect service for the Yaris iA, which includes emergency SOS calling and an automatic collision notification system. Additionally, young drivers would benefit from features that parents can program to encourage safer driving habits and to remotely monitor vehicle usage while the car is away from home. When I was in college, I had a 12-year-old German car that had traveled 120,000 miles on Michigan roads. That rusted Ford Fiesta was nickeling and diming me to death, and finally, the repair bill was big enough that I decided it was time to make a monthly car payment on something new and reliable. My new and reliable car was basic, a Ford Festiva without so much as air conditioning. But it never broke down aside from one rear wheel bearing re-pack on a cross-country road trip, and the budgetary concessions I made in order to afford the small monthly payment were, in the long run, well worthwhile. You see, I understand why you’re looking for a new, cheap set of wheels. You want something to drive that doesn’t require constant repair and that will last a long time… or at least long enough for you to make more money and to buy a better car. It needs to be fuel efficient, it needs to be as safe as a small car can be, and it needs to be cheap. The Yaris iA makes an excellent case for itself. And, unlike my first new car, it isn’t obviously inexpensive. Especially once you’ve gotten inside it. Better yet, heading into the summer of 2017, Toyota is offering a $2,000 rebate on the Yaris iA, or no-interest financing for 72 months, or cheap lease deals that result in an appealingly low monthly payment. 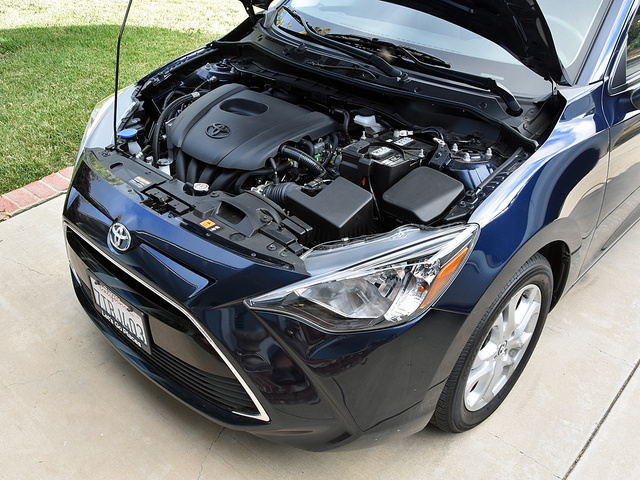 Add Toyota’s offer of free scheduled maintenance for two years or 25,000 miles, and the Yaris iA shapes up to be a raging bargain. Best of all, this car is more than just a great deal. In my opinion, it’s the best subcompact sedan you can buy. What's your take on the 2017 Toyota Yaris iA? Have you driven a 2017 Toyota Yaris iA?